For technical assistance or to report any website issues please address your inquiry to the above email address. FIRSTCARD ATM provides the opportunity for businesses to own and operate ATM cash machines or Full Service ATM programs. Your company can either purchase the ATM outright or choose a flexible lease-to-own program. Since 1997 with 1,000’s of Locations and counting, FirstCard ATM: is the most complete and trusted ATM Program on the market. FirstCard ATM: Cutting edge technology with online reports and Smart Phone App. No matter the size of your business FirstCard ATM: has a program that will make your site look fantastic. ATMs bring in more customers with more cash. You get more up-selling higher sales, and impulse-spending. ATMs bring in more customers & cash. An ATM in your business means more cash in your pocket! Get your pay-at-the-pump customers into the store • Get them to come back more often. Don’t miss your opportunity to attract new customers, retain existing customers, and maximize sales opportunities! A properly promoted ATM cash machine in your business drives bottom line profits by getting more customers in, getting them to spend more on each visit and getting them to come back more often. most amazing customer support around! More Ways Than Ever To Attract the new ATM user! We’ve added several useful pump toppers and more amazing ATM promotional layouts that allow you to build a loyal ATM audience to your location. What Else Does FirstCard ATM: Offer? We’ll Tell You! 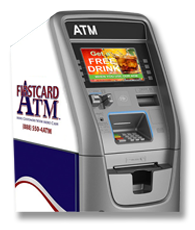 Since 1996 Firstcard ATM has been helping hundreds of businesses across the country to increase their sales and generate more profit by having an ATM onsite. We provide a premium program and one of the best values for ATM cash machine ownership available in the industry today. 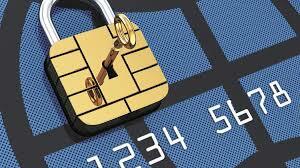 We offer a total “turn-key” solution that goes well beyond just providing the ATM. We are a major distributor and an approved vendor for Sysco, Carl’s Jr. and a number of other companies. We provide at installation all the necessary signage to properly promote your new ATM. Free of charge you will be able to receive 24/7 service. You are given on-line access to all your ATMs. Our ATMs are manufactured by NAUTILUS-Hyosung; the leader in the retail ATM industry with nearly 80,000 ATMs operating in North America. FIRSTCARD ATM has been a Master Distributor (1 of 13 in North America) and maintained ASP certification (the highest level) since 1999. The NH/FIRSTCARD ATM no hassle warranty program is the best in the industry! Our transaction processing network, RBS Lynk is among the largest transaction processors in the world. Accuracy, exactness, promptness and network connectivity is your key to a successful ATM program. All transaction income is electronically transferred into your bank account on the 5th business day of the month (for the previous month’s transactions). FIRSTCARD ATM has placed nearly 1,500 ATMs in the US and works mainly with large nationally branded groups and associations that demand the highest level of quality, support, service and professionalism. Burger King, Carl’s Jr., McDonald’s, Unocal, Tesoro and many other well known corporations have chosen FIRSTCARD ATM after careful examination, proven reliability and dependability. Now you get the same service as the biggest guys! 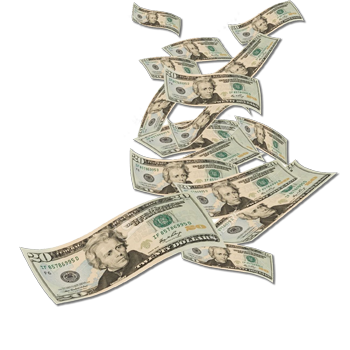 Call Tom Busi, President/CEO @ 209/609-4800 or Larry Critchfield, Executive VP @ 888/550-4ATM for more information about how to get “More Money in Your Pocket”. Firstcard ATM has signage available for your location. We also have paper for all ATMs as well as all other supplies your ATM may need. Call for pricing. 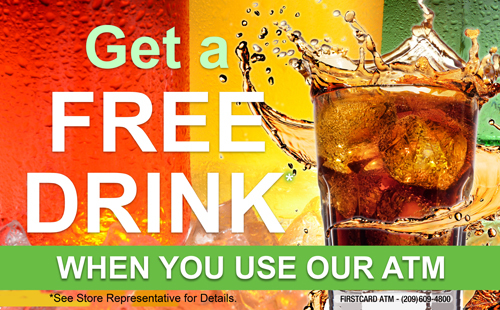 FIRSTCARD ATM provides the opportunity for businesses to own and operate ATM cash machines. The company can either purchase the ATM outright or choose a flexible lease-to-own program. You stock cash in the ATM, then when the customer withdraws cash that amount is electronically removed from their bank account then electronically transferred to your bank account. Your keep all the profits from transaction revenue generated from the ATM. $69.95/mo to start NOW-find out how... Call Tom Busi @ (209) 609-4800 today!